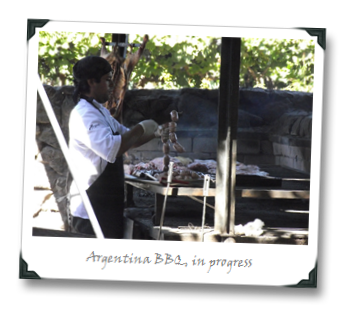 You get stuffed like a veal calf, mostly on splayed goat, beef, and half-a-dozen different preparations of sausages, all done up Argentine Barbeque style. 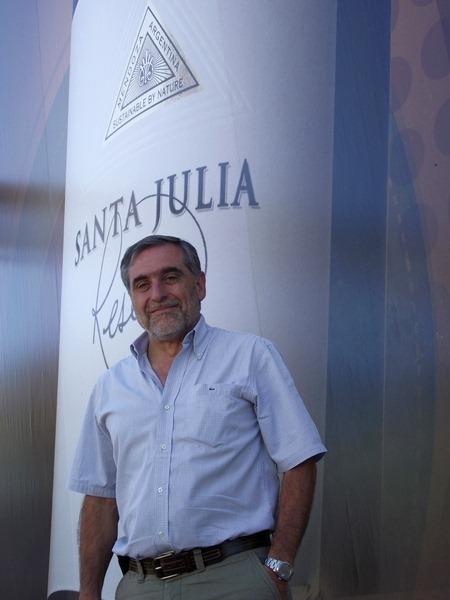 You fall somewhat under the kind-old-uncle spell of Director José Alberto Zuccardi, or are simply worn down by his seemingly endless wellspring of good cheer and all-around positive vibes. 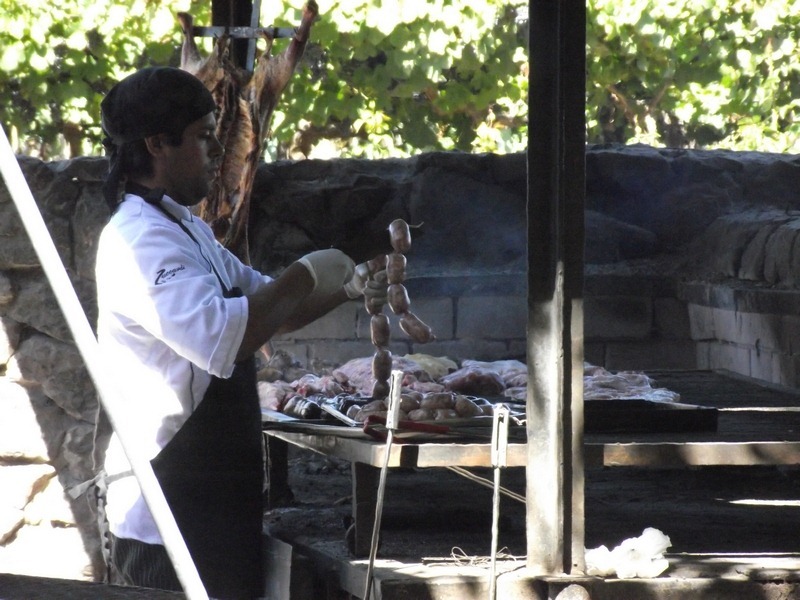 You realize that there’s good reason why books like Opus Vino call Zuccardi’s “Q” line “the portfolio stand-out.” If you’re not too stuffed on splayed goat and sausage to pay attention, that is. 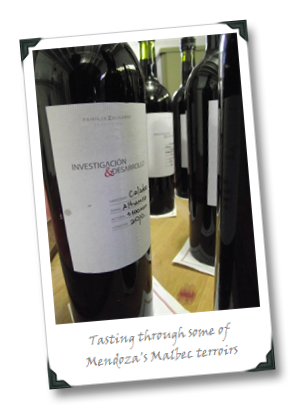 Also, you might get tested on your Malbec blending skills (more info. on that – and on whether or not I passed – after the jump). Despite a 2 million case / year production, Zuccardi still lives up to the “Familia” tag, particularly when they’re stuffing you at lunch and educating you on the proper method of sharing Yerba Mate tea Argentina style. And it’s still a family-run outfit: José’s father planted their first vines in 1963, mostly to show off an alternative use for the construction irrigation system he designed, but he “fell in love with winemaking” (funny how that happens), as José explained it to me (José’s been on board since `76, and his children are now involved in various aspects of the business). 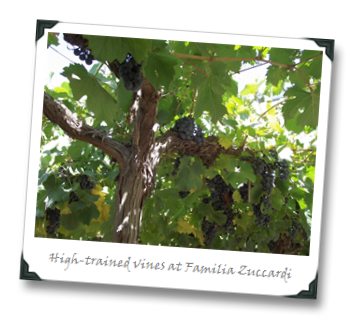 Family ties do not a great wine guarantee, however. Defining Zuccardi’s “Q” as a “great” Malbec is, of course, a debatable matter, but after tasting through a not-insubstantial amount of Malbecs during my March jaunt through South America, let’s just say that I’m pretty confident telling you that it’s unlikely the “Q” would be considered anything other than at least “damn good” even by those who find Argentina’s signature dark Malbec wines to be a bit too… brutish for their personal tastes. Malbec is only part of what Zuccardi does, and they’ve got 40 hectares of experimental vineyards with 38 different grape varieties at play, and a unique series of test facilities in which to try out their potential. The results are, as one might expect, rather mixed, but Zuccardi are for sure onto something with their savory, tobacco-laden Tempranillo, which is a graduate of the experimental program (their up-market, rich and velvety “ZETA” bottling is a blend of Malbec and Tempranillo, and was another standout from my tasting there). Medrano – An area by the Mendoza river, mostly sandy-clay soils with calcium carbonate traces, and a relatively (for Argentina!) low altitude of just over two thousand feet. 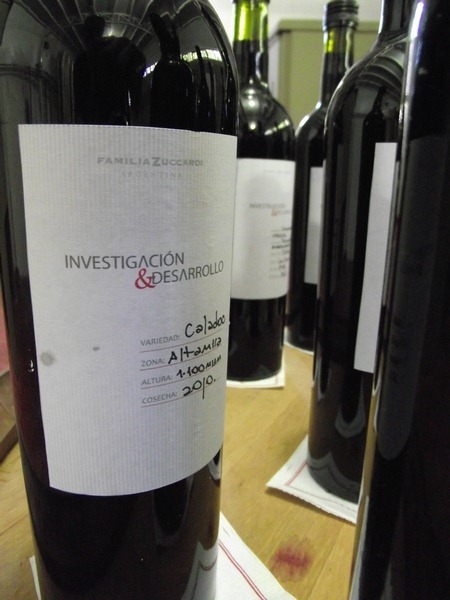 It produces a round, fruity style of Malbec, but with a deep, deep tannic structure. Pretty good, but not my favorite, though I could certainly see the structure adding a nice core element to a blend. Agrelo – Also along the Mendoza river, this area was described as having soil texture of “clay-sandy-muddy” (huh??) with a rocky layer about six feet underneath, with average temperatures a good ten degrees lower than in Medrano. This was a much, much spicier Malbec, and darker, too. It also had more character – more herbal notes, and chalkiness too the tannic structure. Things were definitely getting more interesting. 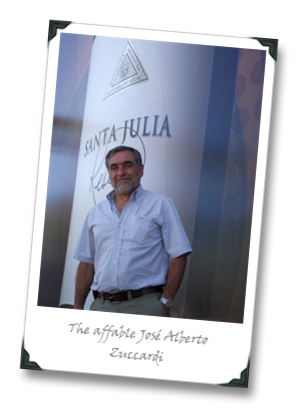 La Consulta – For me, far and away the highlight of the tasting. The vineyard, furthest south of all the areas form which we tasted, has sandy-silt-clay soils. The Malbec looked dark, and it smelled dark, rich, chocolaty, and a little “hot” from the alcohol. It tasted great, though, and had leather and tar elements, and just came off as the most complete of the Malbecs overall. 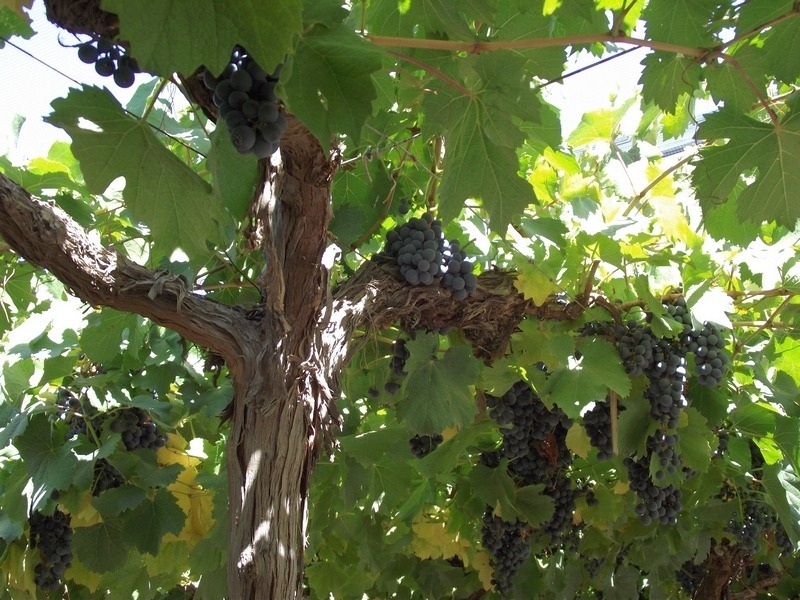 Tupungato – The highest elevation of the bunch (over 3600 feet), and the oldest vines (from 1917), the soils here aren’t rocky but are predominately thin sand underneath a top layer of silt and clay. This was a peppery Malbec, floral, with a great mouthfeel, but the tight dark fruits did not take well to the oak treatment. Oh, well. My verdict: it’s no terroir lightening-rod like Riesling, but Malbec is certainly versatile enough that the structure, spice, dark fruit, and floral components do seem to get tuned in different ways by growing in different spots. My picks for blending, if I was on the “Q” winemaking hook: La Consulta was my #1 (hey, I said it felt complete, right? ), followed by Vista Flores (for structure) and then a splash of Agrelo (for the spice and character). How’d I do? Turns out, in a rare circumstance of me actually not screwing up, I matched what had been chosen for the final “Q” blend. Test passed, beeeatches! Hell, there’s nothing to this winemaking thing after all, right? At least, not after some good sites are planted, tended, farmed, and the wine components are vinified to a high degree of quality and the complete results are handed to you for blending. For under twenty bucks, the nose on this wine is fabulously, almost ridiculously harmonious. Spices, florals, read an black fruits, a touch of vanilla. It’s a real-deal Malbec on the palate – round, almost Merlot-like in it’s mouthfeel and body, with black fruits that give way to tar and enough leather to outfit a Village People reunion. It’s vibrant throughout, with tannic grip and chocolate notes at the finish. All-in-all, a stellar deal of a serious, age-worthy Malbec for the price. "sometimes really, really good wines are not entirely made, and not entirely born, but more likely come into being through a process that exists somewhere between those metaphysical streams" If you only just now learned that, pal, then this may be the last time I visit this blog. I should add that I talk to people every day who are surprised to learn that wines are made by producers who purchase grapes and create brand names for individual markets, and aren't themselves cute little families with a dozen acres of vines in their backyard. So I'd be lying if I said the concept of a continuum of wine quality (from wines blended from vast territories of grapes to make juice shipped in enormous containers overseas and bottled at destination countries, to those fro tiny parcels of land made with minimal intervention almost to the point of being draconian) was new to me, but we shouldn't underestimate how new it can be to a lot of people who have been drinking wine for a long time. Not t hat they're dumb, they just never had exposure to the details behind the stuff. It's difficult to strike the proper balance between what goes on in my brain (esoteric and geeky) with the spirit of what I think needs to eb conveyed about a given topic, and in this case I probably didn't strike it too well. Patrick, we are only talking about WINE here, not politics and religion. Joe, you are a little geeky, but to me you love and enthusiasm for wine and your genuine interests and repsect for your followers come through very cleary. I am also a certified Sommelier and I feel you do a good job of tarketing your comments to what is obviously a wide range of knowedge among your readers. I believe we wine "experts" drive too many people away from wine, or at least experimentation of different wines, by condenscending commentary, whether consciously or not. If not careful we make WINE something intimidating and make people self-conscious about looking stupid or silly if they get something "wrong". 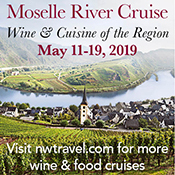 Your articles give a lot of nuggets of knowledge for all levels of knowledge, while never losing track of the fact that wine and all things related to wine should be fun and pleasurable. Really, thanks for the kind words. I often find myself saying things like "this is wine, it's not Japanese earthquake relief efforts, we need to lighten up!" when I'm at gatherings of wine pros. Taking the craft and the love of it seriously are wonderful, sacred things; taking ourselves too seriously in the process is not. BTW – I don't want to project too much of all that onto Patrick here, because it might not be the intention in his comment. I have a track record of welcoming opinions of all shapes and sizes here and that includes allowing people to publicly state when they think I'm being an idiot, lack experience, etc., etc., etc. I'll take that trade-off any day for allowing open discussion to happen int he first place.